In support of the State Department’s “New Silk Road” initiative, U.S. Central Command (USCENTCOM) formed a planning team of subject matter experts spanning the Department of Defense (DOD), the interagency community, academia, and the U.S. railroad industry to provide recommendations that advance the development of a national railway system for the Government of the Islamic Republic of Afghanistan (GIRoA). The Afghanistan National Railway Plan (ANRP) was provided to the Afghanistan Railway Authority (ARA) in August 2013. The ANRP was developed on the basis of Afghanistan’s urgent need for a national transportation system as a precursor of economic development and political stability. Expansion of the existing 75-kilometer rail line could ultimately allow Afghanistan to export minerals and agricultural products, significantly enhance its position as a regional trading partner, improve domestic commerce, and link products, consumers, and markets across Eurasia and beyond. Assessing the economic viability and technical and financial feasibility of a national railway system for Afghanistan, as well as the regional connectivity imperatives, to develop recommendations for large capital-investment infrastructure projects was a nontraditional assignment for USCENTCOM. The railroad expertise formerly resident in the U.S. Army Reserve has been significantly reduced to tactical-level repair, operations, and advisory capability. Notwithstanding these planning challenges, USCENTCOM partnered closely with the Task Force for Business and Stability Operations, U.S. Transportation Command’s Joint Distribution Process Analysis Center, the Surface Deployment and Distribution Command’s Afghanistan Railway Assessment Team, the Center for Joint and Strategic Logistics at National Defense University (NDU), and United States Forces–Afghanistan to collectively plan, model, assess, and validate the recommendations in the ANRP. Invaluable to DOD planners was the voluntary technical assistance provided over the 18-month planning process by the Department of Transportation, Federal Railroad Administration, Department of State, and Treasury Department, as well as the largely pro bono support from rail, mining industry, and cultural experts from Columbia University, George Mason University, and Michigan State University. While these organizations formed the core planning team, several other stakeholders, including other DOD organizations, were critical to reviewing and refining the ANRP. The planning effort culminated in February 2013 at a stakeholder review workshop, co-hosted by the Near East South Asia Center for Strategic Studies at NDU and USCENTCOM, when 56 representatives from 24 organizations conducted a detailed assessment of the draft plan. Highlighting the workshop was the participation of the Afghanistan Railway Authority, established under the Afghan government’s Ministry of Public Works in September 2012, and the Ministry of Mines. Guidance, discussion, and buy-in from these key Afghan representatives were critical to reshaping the preliminary ANRP into an actionable plan reflecting the requirements and priorities most relevant for Afghanistan. Afghanistan is blessed with billions of dollars’ worth of accessible mineral wealth (primarily copper and iron ore) but does not currently have a railway capable of transporting high volumes of these lucrative exports. Similarly, the country relies on relatively inefficient trucking routes for vital imports such as wheat, cement, fertilizer, consumer goods, and petroleum. The absence of a railway system dampens trade and inhibits the landlocked nation’s economic growth and trade with its neighbors and global markets. A railway could facilitate commercial exchange and promote stability, serving as a regional hub for Central and South Asia. The potential for significant revenue enabled by rail could aid in reducing poverty and improving the standard of living of the Afghan people. A railway is also critical to the country’s security, with select rail corridors supporting national defense. The potential of these benefits has drawn railway development support from the Central Asia Regional Economic Cooperation (CAREC) program, South Asian Association for Regional Cooperation, and Afghanistan-Pakistan Border Region Prosperity Initiative, which was launched by the G-8. Sustainable growth is the best way for Afghanistan, a largely agrarian country, to reduce dependence on foreign aid. The country is eager to leverage its vast iron ore and copper deposits, mines that could generate a total of $78 billion in corporate taxes and royalties by 2040. Geological surveys also indicate the country possesses exploitable reserves of valuable elements such as lithium. In Afghanistan, rail and mining development are integrally linked; mining requires rail to transport ore efficiently to market, and rail is reliant on revenue generated by exporting ore. Competitive analysis indicates that current low-cost global producers of iron ore, including Brazil and Australia, are able to extract, rail, and ship to Asian markets for as little as $39 per metric ton (2012 equivalent). To successfully compete in the global iron ore market, Afghanistan must approach this level of efficiency. Delivering hundreds of millions of metric tons of minerals to market at competitive rates will require expeditious rail routes linking mines with seaports and Standard gauge track able to support heavy-haul loads. The ANRP forecasts 75 percent of the country’s estimated rail freight traffic between 2017 and 2040 will be mineral transport. The rest of the traffic will represent shipments of agricultural products, raw materials, and finished goods to and from the country, shipments that will grow as Afghanistan’s society modernizes and accumulates wealth. Afghanistan’s mineral abundance, widely dispersed throughout the country, could ultimately exceed $1 trillion. The country has been known since antiquity for gemstones such as lapis lazuli and emeralds, but the greatest potential for wealth generation consists of bulk quantities of copper and iron ore available close to the Earth’s surface. Seven iron and copper mining “areas of interest” would produce the majority of the country’s export earnings: Haji Gak, Syadara, and Zarkashan for iron and Aynak, Balkhab, Dusar-Shaida, Kundulan, and Zarkashan for copper. According to forecasts, mining operations would yield about 58 million metric tons of ore annually, almost all of it requiring rail transport. Production totals could approach 1.4 billion metric tons between 2017 and 2040. Minerals from Haji Gak, acclaimed as one of the world’s largest iron reserves, account for most of the anticipated freight demand for a proposed southern line. Haji Gak’s output is expected to be four times that of all the other mining areas combined. Afghanistan offers many advantages as a source for minerals to supply the teeming markets of fast-developing South Asia. Tajikistan: construction of railway line Kolkhozabad–Dusti–Panji Poyon–Afghanistan border (estimated cost of construction $90 million; implementation period of the project 2012–2015). These projects would link northern Afghanistan rail lines, via Turkmenistan, to the Caspian Sea, which would expand Afghanistan’s commercial opportunities to a new part of the world. The ANRP is underpinned by the Commercial Market Feasibility Analysis (business case), Terrain and Freight Rail Corridor Feasibility Analysis (technical and financial feasibility and risk analysis), and Legal and Regulatory Framework (proper governance and facilitation of economic viability). The plan supports the achievement of Afghanistan’s strategic priorities, which are to enhance economic growth and economic development, facilitate regional cooperation and development, and better connect the people of Afghanistan. 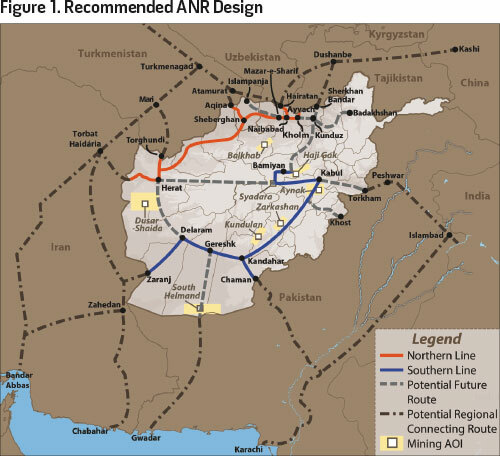 The ANRP supports these strategic priorities by providing analysis and recommendations for four sequential key decisions to effectively expand Afghanistan’s existing railway and identifies the critical path for timely and integrated railway development, operation, and sustainment to achieve the best possible, most financially viable national rail system over time. The key decisions are to finalize the primary and supporting railway purposes, determine the preferred rail system design, determine the most suitable railway ownership model(s) and management structure, and determine regional connectivity requirements. These four decisions are foundational to ensuring successful railway development and implementation. Finalize the Primary and Supporting Railway Purposes. Afghanistan railway development will be driven primarily by transport of iron ore and, to a much lesser degree, by copper cathode, merchandise, and transit traffic transport. Cumulative mineral, merchandise, and transit traffic shows potential for approximately 1.8 billion net metric tons of freight available for railway transport between 2017 and 2040. Mining is expected to generate approximately 76 percent of potential railway freight traffic demand. Merchandise traffic, including mine-driven imports required for mine development and commercial imports (grain, fertilizer, petroleum, cement, machinery, and other equipment), is expected to generate approximately 17 percent and transit traffic, 7 percent. The greatest potential for wealth generation consists of bulk quantities of copper and iron ore. The best prospects for near-term revenue generation center on the seven mining areas of interest: Haji Gak, Syadara, and Zarkashan for iron and Aynak, Balkhab, Dusar-Shaida, Kundulan, and Zarkashan for copper. Estimated net tonnage of minerals from Afghanistan’s mining areas of interest exceeds 58 million metric tons per year, on par with some of the largest freight operations in the world. Output from the Haji Gak iron ore area of interest is estimated to account for 80 percent of all mineral traffic and 60 percent of all freight traffic. To successfully compete in the global iron ore market, Afghanistan will need to approach the level of efficiency achieved by low-cost producers in Australia and Brazil at $39 per metric ton (2012 equivalent). If ore is not moved competitively to market by utilizing the shortest and most efficient railway route to seaport, the railway will lack the revenue to expand and sustain itself. Enabling regional connectivity and establishing a regional transportation hub that facilitates trade, industry development, and commercial-based traffic, and eventually passenger transit to better connect the Afghan people, are important supporting purposes of expansion of the railway system. Finalize the primary and supporting purposes of the national rail system. The primary purpose is to enable self-sustainability and economic independence via mineral-based traffic to provide regional connectivity and serve as a regional transportation hub, with supporting purposes of trade facilitation, industry development, commercial-based traffic, and eventually passenger transit to better connect the Afghan people. Support development of mining areas of interest to meet transport demand thresholds needed for profitable railway operations. Prioritize and develop the Haji Gak mining area of interest first. Determine the Preferred Rail System Design. Economic feasibility, including the need to negotiate Afghanistan’s rugged terrain, inevitably dictates the length and location of proposed railway corridors. The Terrain and Freight Rail Corridor Feasibility Analysis evaluated the technical and financial feasibility of developing a national rail system. Employing a three-phased approach, seven assumption-driven construction and operating scenarios were examined to determine a preferred design. Results of the analysis indicate the cost to build rail lines over steep mountainous terrain, which significantly increases the number of bridges and tunnels, is approximately $9.3 million per kilometer, compared to $1.9 million per kilometer for flat and undulating terrain. Therefore, constructing and operating a rail line traversing the Hindu Kush in the immediate future is not cost effective. The recommended railway design consists of two separate, purpose-built rail lines with potential for future expansion to unify the two lines and support emerging economic sectors at some time in the future, as shown in figure 1. The two lines consist of a southern, mineral freight–focused, Standard gauge line, which primarily supports transport of bulk mineral ore to seaports in Pakistan and/or Iran for onward shipment to global markets at the lowest possible overall (rail and sealift) transit cost; and a northern, commercial freight–focused, Russian gauge line, which expands the existing 75-kilometer line running between Hairatan and Mazar-e-Sharif, connects the Central Asian Republics and Iran via Afghanistan, and supports the recent memorandum of understanding for the establishment of railway transport infrastructure linking Turkmenistan, Afghanistan, and Tajikistan. 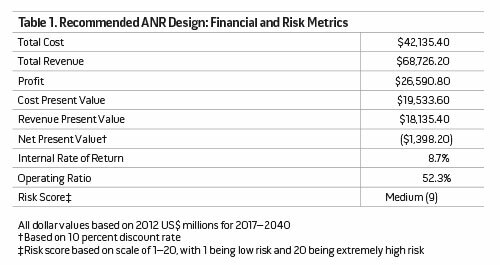 The financial metrics and risk score for the recommended national railway design are included in table 1. These financial metrics reflect railway operations exclusively and do not include the positive financial impacts estimated for potential mining operations. The combined southern and northern rail lines of the recommended national railway design do not achieve a positive net present value (NPV) and 10 percent internal rate of return (IRR), though the calculated operating ratio of 52.3 percent reflects a generally favorable revenue-to-operating cost ratio once rail lines are operational. To more fully analyze the two primary rail lines comprising the national railway design, the planning team considered both the southern and northern lines as independent railways. The southern mineral freight–focused line generates a positive $635.6 million NPV, an IRR exceeding 10 percent, and an operating ratio of 53.6 percent. The northern commercial freight–focused line is less economically viable with a negative $2.3 billion NPV, an IRR less than 10 percent, and an operating ratio of 47.6 percent. Table 2 presents the financial metrics associated with the recommended railway design of southern and northern lines. 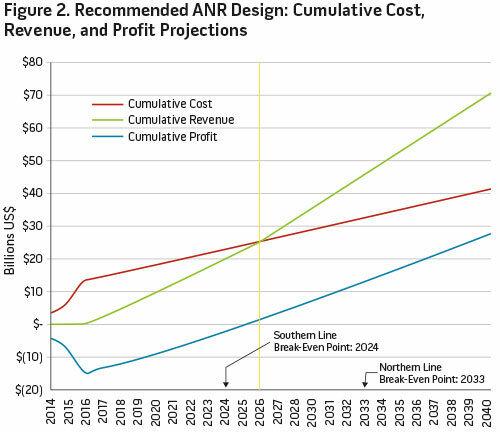 Figure 2 reflects the cumulative cost, revenue, and profit projections for the recommended Afghanistan national railway design over the designated railway lifecycle, 2014 to 2040, and the southern and northern line break-even points, where cost is recovered by sufficient revenue generation. 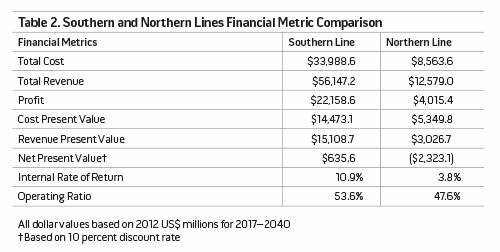 The combination of the southern and northern rail lines is projected to reach the cost/revenue break-even point in 2026. Viewed independently, the southern line is projected to reach its break-even point in 2024, and the northern line is projected to reach this point 9 years later in 2033. The impact of these varying profitability profiles may drive GIRoA to leverage the potential revenue generation of the southern mineral freight–focused railway to offset construction and operations of the less profitable northern railway. Recommendation to GIRoA: Develop and implement the preferred Afghanistan national railway design, the most financially feasible alternative with an acceptable level of risk. It is further recommended that GIRoA consider increasing the assumed mineral freight rate from $0.030 to $0.033 per net ton kilometer to potentially yield a positive NPV and IRR above 10 percent. Additional analysis is required to determine an appropriate mineral revenue rate once a railway operating plan has been developed. Model 1: 100 Percent Public Ownership. The government owns railway assets, including land and infrastructure, and operates and maintains the railway with government employees or contractors. Model 3: Mixed Public-Private Ownership. The government owns “below rail” assets, including land and infrastructure such as tracks, while a private entity owns, operates, and maintains “above rail” assets and infrastructure, including locomotives, rolling stock, and control systems. Model 4: Hybrid Ownership. The hybrid model contains elements of the above models and accommodates dynamic railway ownership requirements. This model could provide the flexibility to focus government participation on some, but not all, rail lines. The strengths and weakness of the four railway ownership models are shown in table 3. Overall, the hybrid model is best suited for GIRoA adoption initially. This model best supports implementation of a southern rail line primarily focused on supporting mineral extractive industries and a northern rail line primarily focused on commercial transit traffic and regional trade. Given the flexibility of the hybrid ownership model, the model could evolve and adapt to dynamic political and economic situations, which may be more suitable for Afghanistan. To support implementation, management, and oversight of a hybrid ownership model, a detailed management structure was also developed for the ARA. Adopt a hybrid ownership model as the initial national railway model. Refine and implement the initial hybrid ARA management structure. Furthermore, this recommendation includes formally approving a minimum 3-year operating budget. Adopt relevant policies, laws, and regulations to support safe, efficient, reliable, and profitable railway operations within Afghanistan. Determine Regional Connectivity Requirements. A key driver of railway profitability is the avoidance of costly transloading operations due to track gauge changes. Because Afghanistan is surrounded by countries whose railways have three different track gauges, regional rail connectivity is a major challenge to operational efficiency. 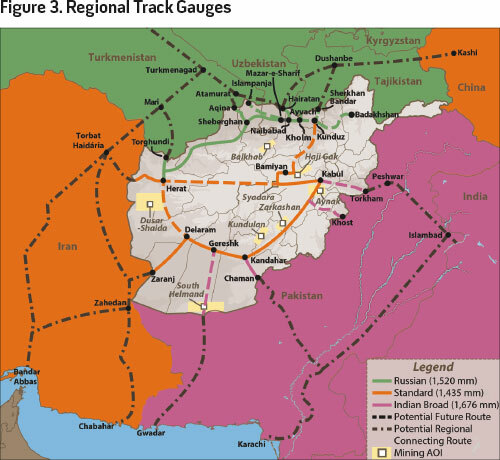 Potential Afghanistan rail freight would be required to traverse multiple Central and South Asian countries with differing track gauges including Standard (1435 millimeters ), Russian (1520 mm), and Indian Broad (1676 mm). Details are shown in figure 3. The gauge of new rail lines is best determined by the gauge of its connecting lines. Since Iran uses Standard gauge and the Central Asian Republics use Russian gauge, selection of the preferred rail system design establishes a separated system of a southern, mineral freight–focused Standard gauge line linking to Iran and Pakistan, and a northern, commercial freight–focused, Russian gauge line linking to Iran, Turkmenistan, Uzbekistan, and Tajikistan. Iran is a primary destination for mineral exports traversing the southern line, offering the most expeditious routing to port, with Pakistan providing an alternate route to mitigate the risk of only one outlet to port. Implementation of Standard gauge for the southern line mitigates the requirement for transloading operations for freight en route to Iran. To address potential requirements to export ore through Pakistan, implementation of a Standard gauge railway within Pakistan or a dual gauge railway should be considered. Northern line operations are commercial, freight-focused, and depend heavily on trade with the Central Asian Republics, all of which operate Russian gauge lines. Implementation of Russian gauge leverages the existing rail line from Hairatan to Mazar-e-Sharif and minimizes the requirement for transloading operations and facilities, with the possible exception of Herat. A transload facility near Herat could support the transport of commercial goods through Afghanistan to Iran, assuming Iran adopts Standard gauge to connect with Herat. Implement Standard gauge for the southern rail line. Implement Russian gauge for the northern rail line. Though there is substantial support for expansion of Afghanistan’s current, single rail line, there are challenges in developing and operating a national rail system. The planning team evaluated risk associated with the preferred design scenario through a broad assessment that weighed 37 risk factors organized in 7 risk categories to account for these challenges and the assumptions used for planning (see table 4). 1. Investment and Funding. As GIRoA does not have the required resources to finance the construction of the national railway on its own, sufficient financing is essential from both the international financial community and private sector. To encourage investment by financiers, GIRoA must ensure that capital and operating cost estimates for projects are accurate; the appropriate laws, policies, and regulations are in place; and an overall project manager is appointed to plan and manage initial development. Land grants could also serve as a means to finance national railway construction. 2. Political (Internal to Afghanistan). GIRoA instability following the drawdown of North Atlantic Treaty Organization forces in 2014 could halt the development of railway and mining operations. National, regional, and local governments are encouraged to work collectively to ensure a sufficient level of governance during and after foreign troop withdrawal. 3. Security. Insufficient security measures could lead to theft, vandalism, and/or terrorist attacks on railway and mining property, infrastructure, equipment, and personnel, resulting in schedule delays and loss of railway and mining revenues. GIRoA should work with regional and local governments and tribes to develop and implement a security plan that encourages regional and local governments and tribes to participate in, and support, security operations. Local employment for security forces, land grants, and revenue sharing could be leveraged as incentives. 4. Operations. Due to a lack of experience, industry experts must be recruited for the startup of operations and to train local labor. GIRoA should also consider sending some people to train on neighboring railways and explore opportunities in railway management education offered at the university level. Afghanistan rail operations must be coordinated closely with neighboring countries to ensure efficient interchange of operations and traffic. Safety and operating standards for equipment, track, and personnel must be developed and promulgated to ensure safe, reliable, and efficient operations. 5. Development. Failure to achieve sufficient project management, acquire and retain technical staff, receive building permits, maintain sufficient water and energy delivery to mining sites, and sustain an adequate labor force could jeopardize expansion of Afghanistan’s rail system. Professional project management and recruitment of the staff needed for construction and for railway and mining operations must be achieved for these mutually reliant sectors. Land use agreements, potential land grant arrangements, and building permits must be both properly negotiated and legally binding to enable railway construction to proceed. Customs arrangements with neighboring countries must also be expedited to ensure railway construction materials and equipment as well as rolling stock and control systems equipment can be imported in a timely manner. 6. Political (External to Afghanistan). Afghanistan’s relations with neighboring countries and their respective railways will have a major impact on the success of the Afghanistan railway. Relations with Iran and Pakistan are crucial to efficient transport of iron ore to port for onward sealift to South and East Asian markets. Negotiations with those countries and their railway programs are a high priority and are essential to revenue generation. Continued negotiations with Tajikistan, Uzbekistan, and Turkmenistan are encouraged to determine procedures for freight originating, terminating, and transiting between the countries. 7. Legal and Regulatory. Afghanistan will need a viable legal and regulatory framework for both the railway and mining sectors permitting and enforcing property rights and the contractual agreements. The ARA will also need sufficient resources and capabilities to develop appropriate economic and safety regulations for the railway. Establishment and enforcement of safety regulations should enable a safe environment for railway personnel and communities near the railway and encourage a more efficient railway, resulting in fewer accidents. 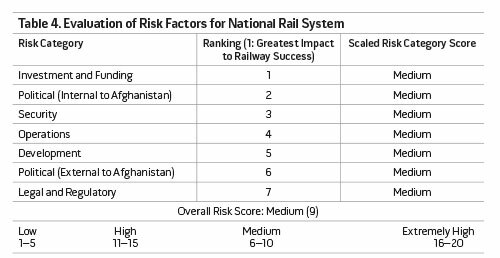 Overall, the preferred national railway design presents medium risk based on key ANRP stakeholder input and is consistent with other large-scale capital investment projects in Afghanistan. Develop and implement a comprehensive railway risk management process to identify and manage risk throughout development and operation of the railway. Assign the ARA chief executive director as the risk management functional lead and provide sufficient resources to the ARA for execution of risk management responsibilities. Require formal approval of project risk mitigation/avoidance plans prior to project funding approval. The ANRP provides a framework connecting Afghanistan’s outlying cities, industrial sites, and commercial interests with neighboring countries and new markets. The implementation strategy describes a macro-level plan for the expansion of Afghanistan’s existing rail line. The expanded railway will help Afghanistan resume its historically important place in international trade and figure prominently in the region’s future stability and progress. The overarching objectives of this implementation strategy are to 1) develop a combined rail-maritime logistics network capable of transporting Afghanistan iron ore, copper, and other minerals in a cost-efficient manner to yield competitively priced exports in the global market; 2) develop a multimodal network to promote development of industries and traffic identified in the Commercial Market Feasibility Analysis; and 3) develop the commercial, financial, and government structures needed to promote the preceding objectives. Private investment backed by firm commitments from the GIRoA is a critical imperative for successful development and operation of the railway. International donors have already taken the initiative in Afghanistan’s transportation revival, but much more assistance is needed. The Asian Development Bank (ADB) is currently the lead donor for advancing rail in Afghanistan. For example, ADB covered 97 percent of the $175 million cost of the Hairatan–Mazar-e-Sharif rail line. ADB has also funded a $2.86 million feasibility study to expand the existing rail line from Mazar-e-Sharif through Sheberghan and Andkhoy to Aqina. The Indian government has offered $1 billion to help build a line from the Haji Gak iron mining area of interest near Kabul. Ownership would likely be mixed, with GIRoA retaining the land and rail lines and private entities largely controlling locomotives and rolling stock. As he contemplated myriad rail projects in 2012, Afghanistan Deputy Public Works Minister Noor Gul Mangal emphasized that further railway development could be instrumental in ending Afghanistan’s economic and geographical isolation: “We would be able to import and export to Russia, Turkey, and even European countries.” That’s a good deal for Afghanistan—and the world at large. Joint DOD and interagency planning, analysis, and collaboration, complemented by academic and private industry expertise, enabled development and delivery of comprehensive recommendations to Afghanistan that can facilitate sustainable revenue generation and regional connectivity. While many railway proposals have been provided to GIRoA, the uniqueness of the ANRP is twofold: the ANRP provides objective recommendations principally focused on best value for the Afghan people, and the ANRP is underpinned by a business case (the Commercial Market Feasibility Analysis) reflecting revenue potential by sector over a 25-year period. Afghanistan and its neighbors face numerous tough challenges to realize the potential economic growth that could potentially result from development of a national railway system with regional connectivity. Interministerial competition, lack of cooperation and transparency, and rampant corruption must genuinely be fixed before the key decisions in the ANRP can be enacted. GIRoA must develop a reinvestment strategy for the revenue generated by a national rail system that supports continued railway expansion and funding for other national priorities. And the people of Afghanistan must tangibly benefit from a national rail system to ensure long-term security and economic success. Time will tell how much of the ANRP comes to fruition, but the collective efforts of the ANRP stakeholders have significant potential to improve conditions for the people of Afghanistan. Colonel Lawrence J. Pleis, USMC (Ret. ), is Chief of the Strategy and Policy Office (SPO) in the Directorate of Logistics and Engineering at U.S. Central Command (USCENTCOM). Colonel Richard Lliteras, USA (Ret. ), is Deputy Chief of SPO. Colonel David A. Wood, USA (Ret. ), is a Senior Associate with Booz Allen Hamilton. Major Matthew D. Bain, USMC, is a Logistics Strategist in the Directorate of Logistics and Engineering at USCENTCOM. Mr. Steven J. Hendrickson is an Associate with Booz Allen Hamilton.